When state-funded institutions for people with developmental disabilities were closed down throughout the United States, few families mourned their loss. But it didn't take them long to discover that the promised alternatives  programs to care for family members at home and in the community  were neglected and underfunded. Today, throughout the US, exhausted parents are providing all day, every day care for their developmentally disabled loved ones, while simultaneously battling for the help and resources they need. For 18 years, Rob and Betsy Holl have taken care of their profoundly disabled daughter, Megan, at home, with no help. Now middle-aged, exhausted by the constant stress of juggling Megan's unrelenting "tag team" care needs with the demands of raising their other child and hanging onto their jobs, they feel that they have hit the wall. The Holls applied to Florida for help in 2001 but are still waiting, as are 200,000 others in that state, and thousands more throughout the US. Marsha Desso and Larry Kessler might be considered luckier. Their son Stuart was born autistic in 1957. As a violent young man, he was restrained in state hospitals and jails, but today his elderly parents are able to care for him at home with the assistance of a state-funded caregiver. The state is cutting back, however, and Stuart's care budget is in growing jeopardy. Facing cancer herself, Marsha wonders what the future holds for her son. These are stories of frustration, disappointment, and occasional joy. Both families demonstrate the power of love and courage under the most difficult circumstances  but how long can they do it alone? Refrigerator Mothers: From the 1950's through the 1970's, autism was widely blamed on cold and rejecting mothers. This film explores the devastating impact of this misdiagnosis through the stories of seven mothers and their children. Fragile X Family: Takes viewers inside the lives of a developmentally disabled family who are affected by Fragile X Syndrome, an inherited chromosomal disorder which is the second most common cause of mental retardation. 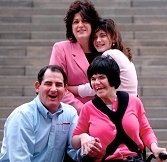 Mothers of Courage: Bethany has multiple physical and developmental disabilities. Like thousands of dedicated parents, her mother has had to fight for years to get Bethany the medical and social services she needs. Mayor of the West Side: What happens when love gets in the way of letting go? As a teenager with multiple disabilities prepares for his Bar Mitzvah, his family and community consider what Mark's life will be like when they are no longer able to protect him. Don't Give Up: A year in the life of a four-year-old who has autism, focusing on a special therapy program designed to break through Adrian's communications barriers.